It’s my daughter’s sixth birthday today. Olivia was born in Banbury hospital as I sat in the delivery room working on my laptop on a pitch for the Guinness World Records account. You could say I was a considerate parent preparing her for life with a workaholic. You could say a number of less complimentary things. At the time of the GWR pitch, I was running the London creative agency Fijit with the very talented Neil Mathieson. One of our specialities was character creation for the likes of Jim Henson, the BBC and the Discovery Channel. 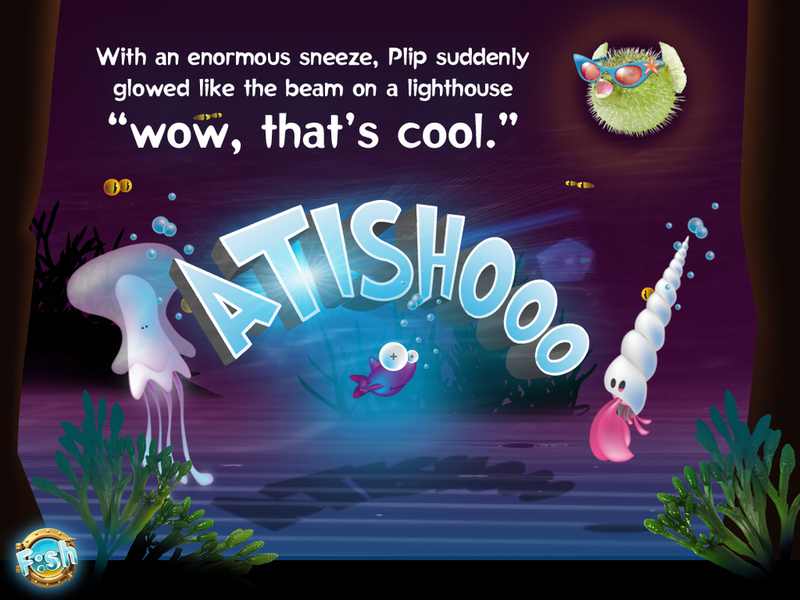 F:sh was one such project kick-started as a showcase for potential cartoon fun. Nothing became of this single illustrated concept and it languished in our ‘what might have been’ pile. Time and concepts passed, with thoughts turning away from the potential for an animated series to the possibility of a printed children’s book. Another nice idea but one without the time available to bring the plans to fruition. Fast forward to 2010. 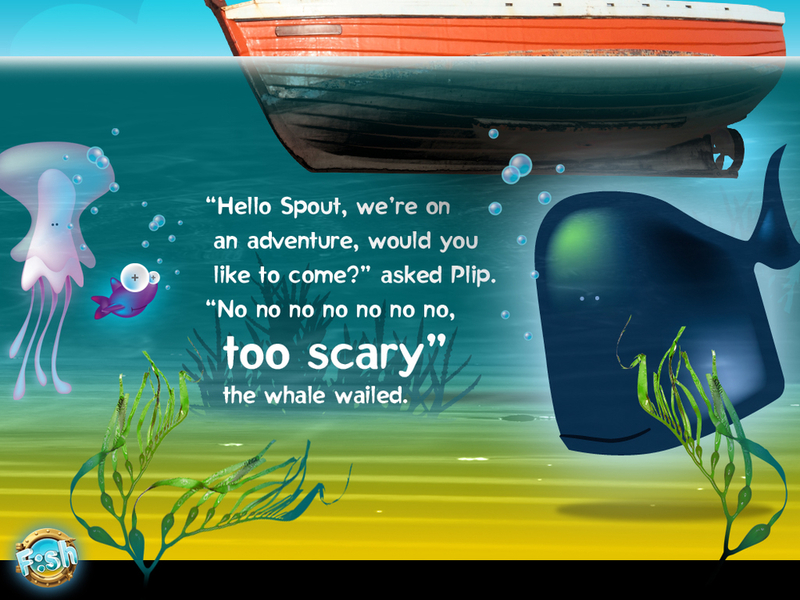 The iPad launches and Brandwidth is at the forefront of pioneering app development for this new large scale iPhone ideally suited to digital publishing – the perfect platform for children’s book characters. We dedicated about three weeks of artworking and programming for F:sh to function universally across all Apple devices – iPad, iPhone and iPod Touch. It’s true that we wanted F:sh to be a showcase of our in-house talents and there are a number of additional features and effects we could have included. We made the conscious decision to use this app to showcase not just our creative skills, but also our strategic and organisational abilities as well as strict time management and cost control. The feature-set is as much about what we left out as what we put in. Many children’s book apps include a bewildering array of interactive elements that seem to have come from a client’s wish list, with every box checked. We avoided unnecessary colouring activities, games and digital distractions. Every interactive feature within F:sh is there because it adds to the narrative rather than detracting from it. The focus remains on storytelling as F:sh takes advantage of the digital format by introducing a continuous journey through the book where the reader scrolls from left to right, or up and down at one stage to reveal the next part of the story. The main characters move seamlessly from one ‘scene’ to the next following the narrative and introducing more characters and situations as the story progresses. At key stages the reader is prompted to interact with various elements and in some instances a specific activity such as shouting at the screen prompts the story to continue. We added a simple yet effective feature to the app – virtual water, where the surface of the sea tilts to match the angle of the device, with the characters bobbing around as if floating within the screen. We built the F:sh website to take advantage of the same accelerometer control and act as a preview of the feature when viewed on an iPad, iPhone or iPod Touch. Printed children’s books have always encouraged the reader to add their own name to the first page, for that personal touch. With apps no longer constrained by ink on paper, a child can not only add their name but also their photograph – either directly on iPad2 or iPhone, or from the photo album on iPad1 or iPod Touch. 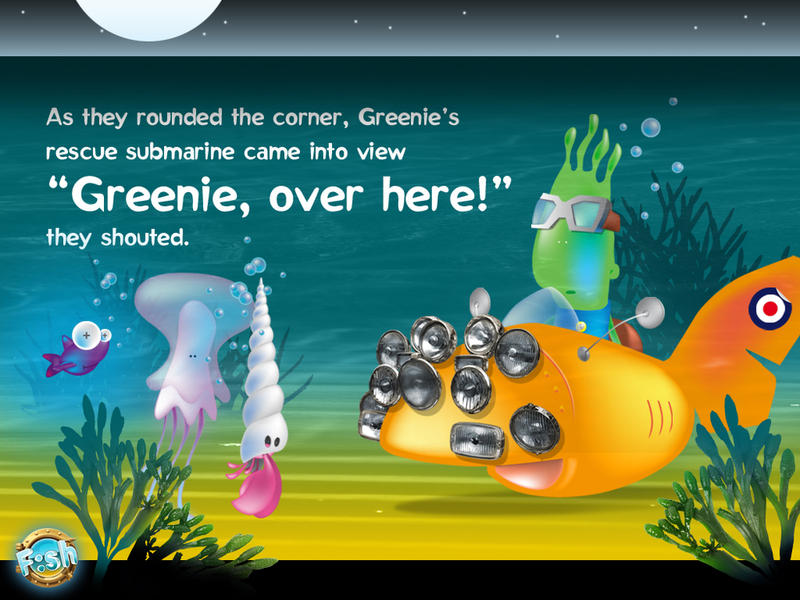 For F:sh, we extended this feature by taking that picture and adding it to the story where the photograph from the introduction page makes a surprise reappearance in the final scene as Groober pilots his submarine into view with the child’s face looking through the porthole. 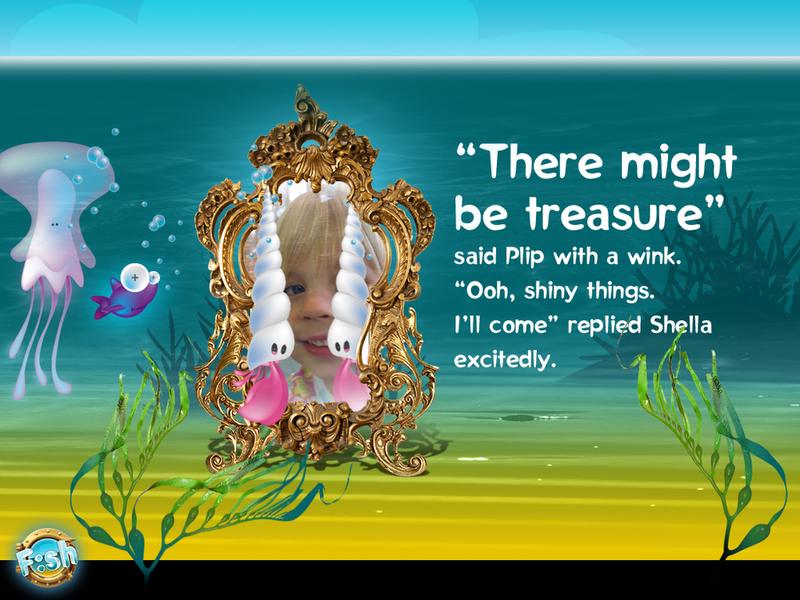 Change the photo over and over to keep the book feeling fresh and encourage repeat reading, with the end scene as a reward for completing the story. With three weeks to develop the app, it wasn’t the build that proved complicated. The meticulous planning and creation of each screen ahead of scheduled production is where many more hours are dedicated. The attention to detail and thought behind the app is where the genuine value lies. With all illustration, design, writing, music and narration generated in-house, we haven’t just repurposed an out-of-copyright classic. Neatly sandwiching the development is the post-approval targeted promotion of the app via social networks, traditional PR channels and ongoing support via established relationships with Apple and other key players. What’s next? A missed opportunity if you’re not on board. If you still think apps are a passing craze then apply your twisted logic to the music industry. The digital music file is here to stay in much the same way that the app will be around for many years – it’s the hardware that will change, not the format. The way to keep ahead is to be on board now, not standing by the sidelines hoping the app train will pull in at your station. Publishers are witnessing the erosion of their territory by developers who are grasping apps by the balls and just getting on with it. F:sh is one such example. I clearly have a very understanding family and they have endured many long working days to get this far but I hope F:sh stands as a visual testament to their inspiration and support. Happy birthday Olivia.